BookStack_Feb2008, originally uploaded by KenEKaplan. This is a follow up to my first “BookStack” post, which was inspired by a social media wiseman, Douglas Pollei. 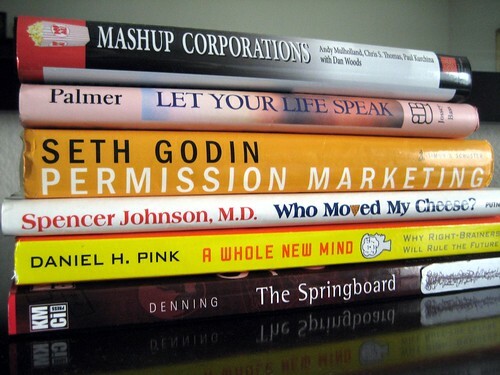 After I finish Seth Godin’s new book “Meatball Sundae,” I’m movin’ ahead to my next stack of books for the year. * “Let Your Life Speak,” a book about listening for the voice of vocation by Parker J. Palmer. * “Who Moved My Cheese,” which is about how we can get unstuck when we need to change by Spencer Johnson, M.D. (a quick read on a plane ride). * “Mashup Corporation,” about the culture of communications change in the corporate world by Andy Mulholland, Chris S. Thomas, Paul Kurchina and Dan Woods. * Seth Godin’s legendary “Permission Marketing,” which I believe is inside me already, but I want to get it in Seth’s words. * “A Whole New Mind,” is about why right-brainers will rule the future by Daniel Pink. Not so sure I believe that yet, so it’ll be cool to feel my reaction. * “The Springboard” is a book by Stephen Denning, who outlines how storytelling ignites action in knowledge-era organization. I’m a big fan of storytelling!